Right now, there appears to be no one – and I mean absolutely no one – more eminently qualified to make a tribute to Jimmy Giuffre than Samuel Blaser. The trombonist worships at the altar of creativity, as Mr. Giuffre did throughout his life. 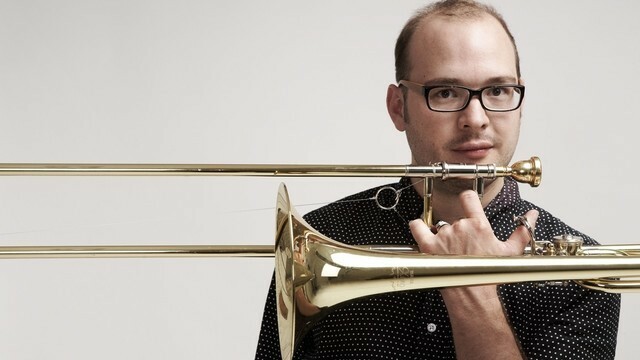 Likewise during his short life so far, Samuel Blaser adventurous trombonist, composer and arranger has journeyed through jazz from writing extraordinarily through minimalist works for trio and quartet to striking experimental orchestral works. Spring Rain is one of those striking experimental works for quartet. It is an album that is long on ideas and on aesthetic matters. In doing just so Mr. Blaser has relocated the smooth quality of sound of Mr. Giuffre’s clarinet sound to that of the trombone. In tall order Samuel Blaser has made an album that is singularly magnificent. 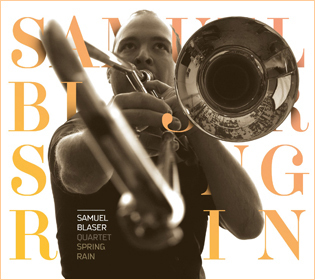 Spring Rain sits at the pinnacle of Samuel Blaser’s compositional and trombone-playing powers. That remains to be seen (he may scale greater heights in the future) but if he never achieves anything better than this album he has ample reason to be proud. The opener “Cry Want” (a Jimmy Giuffre composition) is a superb re-imagination of Mr. Giuffre’s profoundly beautiful slow-dancing piece which engages you from the soul outwards to the body. It is followed by “Missing Mark Suetterlyn” a slow, slightly mysterious ballad edged with a rueful feel. This features thoughtful melodic soloing by Samuel Blaser as does “Homage” which does indeed remind me of the work of the late great and sometimes unjustly overlooked Jimmy Giuffre. Samuel Blaser continues to ring in the changes in mood, structure and tempo, making for a continually interesting programme. The considerable degree of balance and integration of melody, harmony and rhythm, of composition and improvisation, of exploration, individuality and tradition is impressively maintained throughout the music of this extraordinarily crafted album. Samuel Blaser’s take on the cool and of the lineage of trombone is infinitely less than conventional here, seeing him summoning woodwind-like tones from the instrument which floats benignly over the sound of the quartet that in its turn adds a rich and not entirely predictable harmonic foundation to the music. His singing of two and three overtones (over) a note, through his horn recalls the inventions of the great Albert Mangelsdorff here. The surprises, when they come, are effective, but discreet: a gamelan-like riff is played as pizzicato harmonics, a delicate curlicue of a bass line and underpins what sounds like a Gaelic lament, and a close passage develops from a single phrase. These are amongst some of the most breathtaking inventions of this album. As if all of the majesty and mysteriousness of the music on the album were not enough, it sings with youthful enthusiasm and skill and instrumental prowess. It’s music unfettered by academic convention and constraints. And although it may take a while to register, once the music gets under your skin it’s the most exuberant and lyrical programme dedicated to the memory of Jimmy Giuffre you will hear in a long time. Hopefully it will also be the most unforgettable as well.